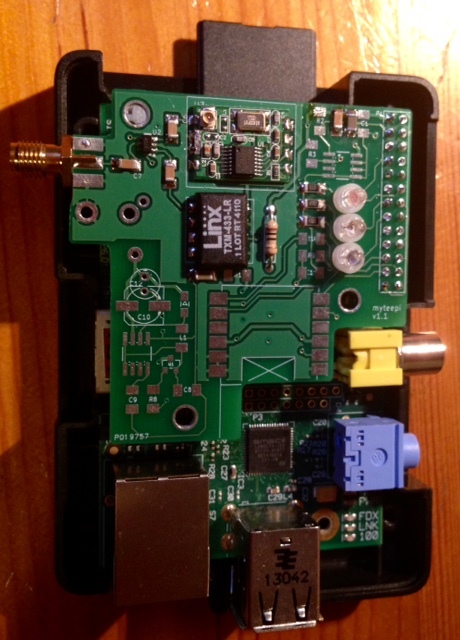 This entry was posted in Hardware and tagged oregon, raspberry pi, rf433. Bookmark the permalink. I’m interested by your offer. Do you also provide software ? I need Oregon decoding capabilities and Chacon / HomeEasy encoding. The objective is mostl to provide hardware with minimum C software to receive RF signals as exemple. The Oregon decoding source can be used with it. I tried your code, with a parralax 27982 transceiver, it works fine. But it uses about 30% of cpu, I think this is caused by the poor quality of the power supply. Have you improved the power supply quality on your shield ? Have you some measures of CPU utilization ? As an improvement, do you consider to add a MPU on this shield and use GPIO serial for communication. Hello, I did not check that point since a long, so right now, on my system, the CPU load for the process running the RF code + many things is about 2% CPU on the Raspberry PI. What I can tell you is that quality of the receiver is really important, you can watch my test of different receivers and I choose the one that have the best reception coverage + less noise (they are going together). The second point is that the cpu consumption can also be related to the number of decoders you are activating in the interrupt procedure. Less is better for sure, so just activate the one you are using. je pense que je peux me permettre de te laisser un commentaire en français, car il me semble que tu es français et dans tous les cas tu peux ne pas le publier, et échanger directement par email par la suite. Ce concept m’intéresse, en fait j’aimerai comprendre comment exploiter tout cela, si tu as quelque détails à donner ? des API ? D’autre part est ce que le tarif inclut le Rasp ou simplement l’extension sur le GPIO ? Et bravo pour ton boulot ! The shield would be GPIO extension (not including the Pi) for detail to use it, you can refer to the Oregon decoding article. It is quite expensive, evenif I understand that there are many work behind it. will you share the schematic for this shield ? I would be interested by such a product (as stated, this is an embryonic clone of a RFXCOM). Nevertheless, the price tag is a little high. 40 € would probably be a good target: medium price of equivalent extensions for the PI. I’m interested in the “RF433 transmitter shield”, too. Could you tell me something about the rage of receiving 433Mhz signals? Currently I’m using a cheap 433-Receiver with a poor range of abou 3 meters. 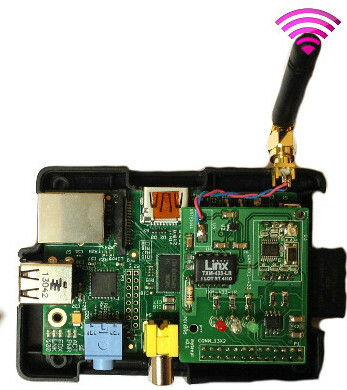 Is it still possible to get the RF shield; if so, then I would be interested.